Between the twelfth and eighteenth centuries, the manicule was one of the most common symbols inscribed by readers in the margins of manuscripts and inserted by publishers in printed books. This small hand with the index finger extended, was primarily used to indicate a particularly important passage of text, but would become so much more than a simple highlighting device. 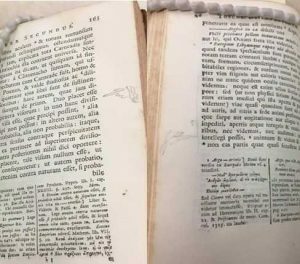 I first noticed this intriguing symbol in some of the eighteenth-century texts from the Rare Books Collection, which I am working with as part of the Cultural Collections Projects Program (pictured left). 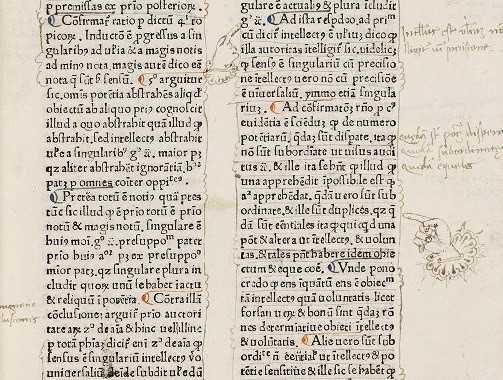 The very first one that I examined had a relatively simple, yet well-drawn manicule in the margins of one of the pages, pointing directly at a sentence in the text. However, as I progressed to the next text, the manicule had become no more than a quick scribble which faintly resembled a hand. The quality between the manicules in these books was striking – why was there such a difference? One explanation could be that in the latter case I had stumbled across a late example of the handwritten manicule, which began to fall out of use during the eighteenth and early nineteenth centuries, and printed manicules, inserted by publishers, took their place. 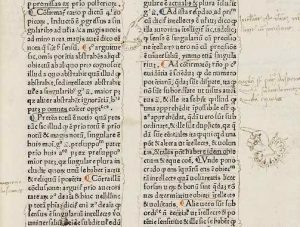 In the centuries before, the handwritten manicule was a sight to behold, with some so detailed that they took over the entire margin of a page. These fascinating hands, which are often severed just after the cuff, shared a generic form yet were undeniably individualistic, reflecting the personality of their inscriber. While each manicule shared the same basic features and function, their appearances were very distinctive. Some would have extravagant cuffs, dotted with jewels, while others sported simple sleeves. The hands themselves could also be extremely detailed and lifelike, right down to the fingernails. 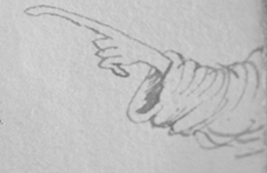 Or, they could be no more than a few scribbles suggesting the barest outline of a pointing hand. They all, however, have the ability to evoke the reading concerns of their long departed writers. Working almost like a signature, the manicule was a personal symbol that readers developed and used to indicate their presence in the text. Indeed, the clothing accompanying the hands can be dated if detailed enough, enabling us to know the exact period in which the reader was active. It is interesting to note that despite the pervasiveness of the manicule in the history of textual culture, it took quite a long time for a single word to come to represent the device. The manicule has had approximately fifteen English names: hand, hand director, pointing hand, pointing finger, pointer, digit, fist, mutton fist, bishop’s fist, index, indicator, indicule, maniple and pilcrow. The term ‘manicule’ has become the one most employed by manuscript specialists, however. The word itself derives from the Latin maniculum, meaning ‘a little hand’ (in any posture), providing quite a general and accurate description of this common symbol. While beginning as a simple indexical tool, over time, the manicule has become a remnant of readers past, a pictorial signature that enabled the reader to leave their presence with the book, long after they had gone. Cicero, Marcus Tullius, John Davies, Adrien Turnèbe, and Petrus Faber. M. Tullii Ciceronis Academica (Cantabrigiae: Typis academicis, sumptibus autem Corn. Crownfield: Prostant apud Jacobum Knapton, Robertum Knaplock, & Paulum Vaillant, bibliopolas Londinenses, 1725). Cicero, Marcus Tullius, and John Davies. M. Tullii Ciceronis Tusculanarum disputationum (Cantabrigiæ: Typis Academicis. Sumtibus Corn. Crownfield. Prostant apud J. & J. Knapton, J. Crownfield, R. Knaplock, N. Prevost, & A. Vanden Hoeck, bibliopolas Londinenses, 1730). William H. Sherman, Used Books: Marking Readers in Renaissance England (Philadelphia: University of Pennsylvania Press, 2008). The last two terms, ‘maniple’ and ‘pilcrow’ are considered mistakes in terminology, as neither accurately refer to a symbol which represents a pointed hand. The rest of the terms have all been correct at some point in the history of texts. William H. Sherman, Used Books: Marking Readers in Renaissance England (Philadelphia: University of Pennsylvania Press, 2008).